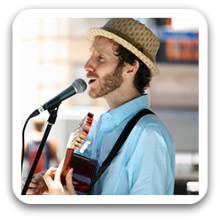 Brisbane Soloist 690 is a professional musician living in Brisbane, Australia. Using his guitar and voice, he covers songs from finger-picking folk and blues to plectrum-strumming rock and top 40. Sounding a mix between Cat Stevens, Neil Finn and Bruno Mars, Brisbane Soloist 690’s diverse repertoire and style can be dialled up or down to suit audiences. Brisbane Soloist 690 has played music since the age of three. His intense passion led him to graduate from the Queensland Conservatorium of Music in 2006 with a Bachelor of Music. Brisbane Soloist 690 has since played professionally in numerous jazz, blues, rock, pop bands. He has toured Australia extensively in highly successful, sell out shows. Thank you, You are amazing. You are extremely talented and helped make our evening very unique. thanks Elizabeth and Lincoln. Thank you for your performance at our small staff event last Friday – everyone enjoyed the mix of music and it was exactly what we needed! Outstanding performer! Was central to making our event a feel good success. I unreservedly recommend! He was great! Would definitely recommend. He was very accommodating to song requests and all the guests had an awesome time. Thanks again! He was excellent and I would highly recommend him! He was so easy to deal with, learnt songs especially at my request and really helped make my 40th birthday celebration a special night with friends and family enjoying a dance or two and commenting how excellent He was!